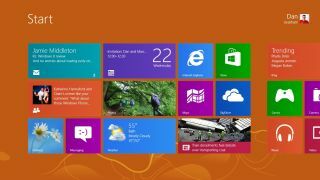 Microsoft claims Windows 8 preceded the iPad - so what? Microsoft's new head of Windows 8 claims that the company came up with the entire Windows 8 design and concept before the first iPad was announced. Julie Larson-Green spoke with MIT's Technology Review and when asked if Windows 8 was developed as a touch-friendly OS in response to the popularity of iOS and Android, she said don't be silly, it was all Microsoft's idea with no outside influences whatsoever. "We started planning Windows 8 in June of 2009, before we shipped Windows 7, and the iPad was only a rumor at that point," she said. "I only saw the iPad after we had this design ready to go. We were excited. A lot of things they were doing about mobile and touch were similar to what we'd been thinking." "We [also] had differences," she added. "We wanted not just static icons on the desktop but Live Tiles to be a dashboard for your life; we wanted you to be able to do things in context and share across apps; we believed that multitasking is important and that people can do two things at one time." She also went on to say that she "can't imagine a computer without touch anymore" and she believes that the vast majority of future PCs will be touch-enabled, while adding that "a finger's never going to replace the precision of a mouse" so there will always be hybrid options too.